[invite] Vanessa: One of the things I appreciate done well, is a good pizza base. I developed this idiosyncrasy from my visits to the south of Italy over the years, where they take their pizza very seriously. 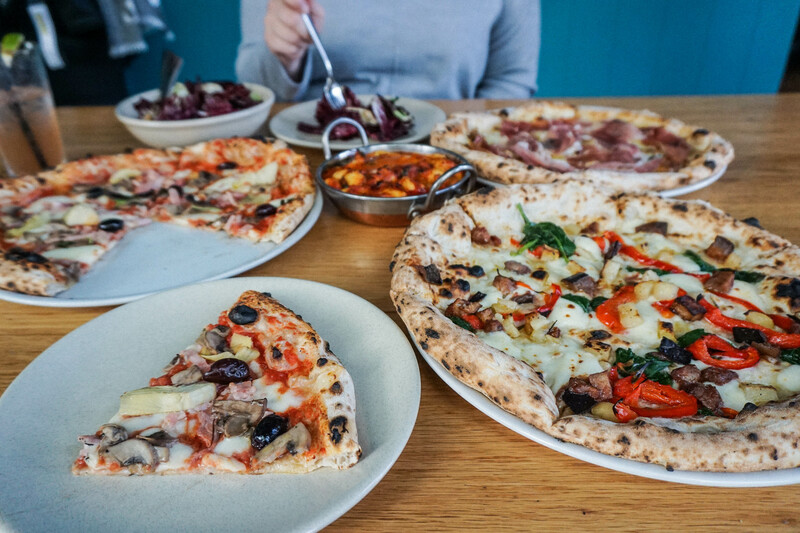 With a plethora of choice for Pizza in Sydney, to stand out amongst the crowd in my opinion, it is all about the base (yes, I have that song in my head too!) and Lucio’s Pizzeria has hit the nail on the head! A midweek, early afternoon jaunt to their Zetland restaurant with Bianca, my sister Bec and our bubbas, saw us pretty much have the place to ourselves. We did choose to dine on a Wednesday at 3pm, so that is why but it made for a very relaxed experience, especially as lately eating out with our Baby FFS in tow is becoming trying! We came with a hunger and readiness to carb load and that we did. We simply cannot pass up the opportunity to have burrata when it’s on a menu. Lucio’s offers a mozzarella bar on their menu with a variety of different mozzarella. In this instance we chose the Burrata ($14) with an accompanying side of Prosciutto Crudo di Parma ($12) . A large, plump ball of burrata, was nestled amongst super fresh and thinly sliced prosciutto. The cheese was oozing once cut and was just perfectly creamy. A fantastic start to our meal. Another go-to for us are stuffed zucchini flowers ($21.50) . Filled with ricotta, lemon and parmesan these well crunchy on the outside but we felt the filling lacked a bit of punch, perhaps a cheese with a more bite would have elevated the flavor. Now on to the main event and let me explain why I was so impressed by the pizza base. Firstly, it took me back to the days of being in Naples and the island our grandparents come from, Ischia. The crust is well-risen, airy and not at all chewy and the base is thin and soft yet stable enough to withstand topping. The toppings used are of high quality and the pizza menu is diverse, makes it hard to choose. We went with the Pizza Tartufata ($26) with strong truffle flavors and fresh slices of prosciutto, this is an absolute winner. 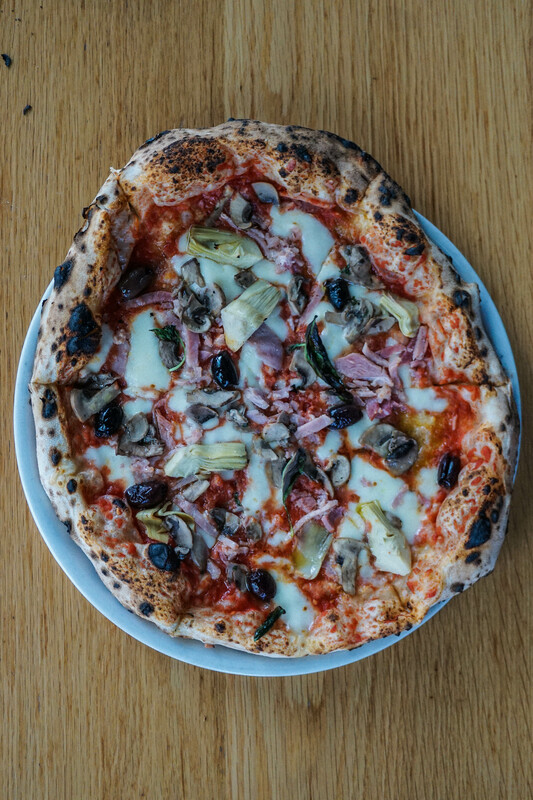 The capriciossa ($24) is a safe bet with its topping of mushroom, ham, artichokes and olives. If you are after a general crowd-pleaser,this is it. The weakest link for us was the vedurine ($21) simply because it didn’t have any bold flavors but it is an ideal vegetarian option. The gnocchi alla Sorrentina ($23) were perfectly soft and smothered in a rich sauce and mozzarella. Probably a little unnecessary given all the pizza we were consuming but good to know that their pasta options stack up. A radicchio salad ($13.50) thrown in for good measure proved to be a not so healthy option with the dollops of gorgonzola that we felt proved too overpowering for a salad. A large space, well-priced and very good pizza, makes Lucio’s an ideal place to eat in both small or large groups of all ages. It’s on our radar now and we will be sure to return. Prev Degani, Zetland. ‘The Pancake Files’! Next Where’s Wolli, Wolli Creek.